We are a community of women climbers. We host monthly gym nights, held at Stone Gardens, Ballard, Seattle Bouldering Project and Vertical World, Seattle. We encourage anyone who is interested to connect on our Facebook group page (https://www.facebook.com/groups/248687838635611/) to self-organize and get out there, whether it's to a gym or a crag, to a boulder field or a mountain. We climb ice, plastic, rock, and scree. We lead like champions and fall off of V0's. We rock. Join us and climb with us! Co-founder and current Mamma Bear to the She Rocks group Alexis Vergalla (photo credit: Daniel Silverberg). Alexis has been with She Rocks since the start and she has the purple swag to prove it. Originally from NJ, she moved to Seattle in 2008 and started climbing in 2010. In addition to She Rocks she's actively involved in the Washington Alpine Club. Her first love is alpine but is happy climbing anything from ice to boulders. Carrisa Pawell is our social media guru and the power behind our smart commentary and engagement. Originally from California (but don't hold that against her), she moved to Seattle in 2014 and started climbing in 2013. Her love of sport climbing is fast being challenged by bouldering. Can't we all just be friends? Check our events page for specific dates and times! Interested in more nights? Different gyms? We went to Flash Foxy's Women's Climbing Festival in March. Read all about the incredible experience on Alexis's blog. Join us Thursday, May 18th from 6:30pm to 9:30 pm PST at the Vertical World in Seattle, WA for a night of radical films featuring female adventurers. I’ve been involved with She Rocks since the beginning. It started in the early spring of 2014 with Esther Dubrovsky. She sent me an email, hoping she found the right Alexis, and mentioned “I want to restart Taco Night…. And my vision includes making it more organized, including some talks by rad girls…” and I responded “As far as community of active women—I’m totally in! Details?” She’d already been talking to a few other women and in the end the group of us included Sarah Ward, Chelsea Ayers, Rachel Randall, Yulia Dubinina, Esther and me. We were all climbers, though rarely climbed together. We had different gyms, different training nights, but we all wanted to be part of a women’s climbing group, whatever that meant. We met often and talked even more frequently—we white-boarded and drafted emails, we created confusing threads on our organizational facebook page. We figured out a color to wear to stand out (purple) and had an amazing logo created for us by the talented Skye Crawford. We talked about becoming a non-profit and we created bylaws and wrote down what we were committing to—how many meetings we had to attend and how we would, collectively, discuss and decide every small detail by consensus. We talked about how to connect and inspire women and we started to host gyms at our particular home bases. 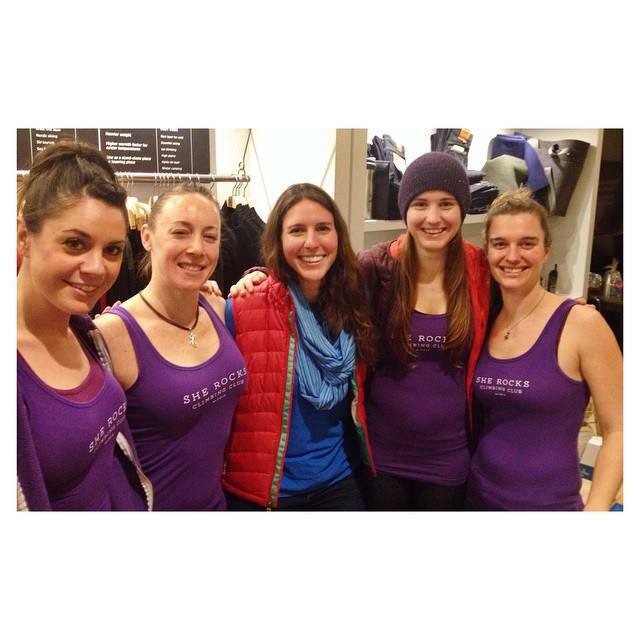 The first gym night we wore purple and climbed together and met one new woman and called it a success. By early 2015 we’d grown but not by an incredible amount. We partnered with some other organizations to do a lecture with Audrey Sniezek at Ibex, we bought a couple shirts that we printed online and we did a group trip out to the Exits, but our organizational numbers were dwindling—life was life and the core group was shrinking. We were still doing gym nights and were trying to expand to new hosts but still were very concerned with finding women that aligned with our ethos and were willing to sign a commitment to consistency. Because I say yes and because I had a flexible job at the time, I was driving to all corners of Seattle once a week, hosting climbing nights at gyms I was uncomfortable climbing at, punching all the punch cards and pushing myself to the very max of my ability to talk to strangers. (I’m actually quite shy and really dislike talking to random people—but She Rocks means I’m trying to catch the eye of everyone in purple, sometimes with comical results). In July of 2015 we did a last-ditch effort to ask for volunteers, but we didn’t really know how to use volunteers or how to help them take over our work and, sadly, we never mobilized that army. Slowly, as more of the group reprioritized their time, I was the last board member. I couldn’t even tell you when this happened—and I think it was mostly because I was the one running the facebook page and I am relentlessly stubborn. So I kept at it. I bought stickers because I had the money and we had a logo, and I scaled back gym nights to Stone Gardens in Ballard, my home base, because I couldn’t handle driving all over the place. We still had an active facebook page and women were still connecting with each other and organizing trips, but I felt pretty alone and like the weight of the group was on my shoulders. Around this time, three women started coming to She Rocks in Ballard and started climbing with me with more regularity. I’m not sure when we became a little crew, but She Rocks nights started to be evenings where I knew the four of us would be talking to strangers and, in the very least, I’d be climbing with my friends. It got easier. Carrisa volunteered to help with social media and Facebook stuff and I handed the passwords over happily. A group of women started to want to climb at VW and offered to host a night and I said “have at it” and Carrisa and I created the event for them. I started to run in to people who knew the name She Rocks and meant to come to a night, or did come to a night, and kept coming back. And kept posting on our site. And kept organizing things outside of what I did—weekend trips, training partners, new gyms. Women were reaching out to each other, women knew there were other women to reach out to. I got us purple sweat bands to hand out at gym nights and bandanas to tie to our harnesses and it became less about talking to strangers and more about seeing familiar faces and saying hi to women who were looking for us specifically. In the summer of 2016 we got a second run of shirts. This time I went all in – I had my boyfriend update our logo, I worked with a friend of a friend who would give me a deal, and I ordered a slew of XS- L shirts, trusting that women would want them. Our gym nights were getting larger and most of the women wore some shade of purple but that first night with the shirts was something magical. I looked out across Stone Gardens and saw the sea of women wearing our logo—this is all us. You could see people at the gym suddenly realize--there is a mob of women, laughing together, climbing together, and they are part of something. When we were starting, I had to explain what She Rocks was, and I never had a great answer. But now I have a better idea. The short answer: it’s a community of women climbers. I’d like to say that I don’t have an agenda, but I think I do. I want any person who identifies as a woman to feel empowered to say “I am part of She Rocks” because she likes our photos, because she’s in our photos, because she climbs with us or because she wants to at some point. I want every woman to know that she’s a part of it when she wants to be—that she can say let’s climb something easy, let’s climb something hard, let’s do it, let’s do this together—and to have a place to say it. There’s no membership card, there’s no fee to entry. I want She Rocks to be about climbing but I also want it to be the network of women who come in and out of each other’s lives, who go to house warmings and going away parties, who are there when someone is hurt, who buy wine when someone has a breakup and who wear tutus when someone has a birthday. This is more than our gym nights, and I want any woman to know that she is part of this, if she wants to be. It’s about showing up, it’s about getting involved. It’s about cheering on your women whether it’s in person or online. Sharing trip plans and sports bra recommendations and finding someone who fits the shoes you bought a half size too small. So that’s She Rocks, and that’s who I want us to be. I’m excited that there are women with our stickers on their cars that I may never meet, I’m excited that there are gym nights that I don’t go to and they still happen. And I’m excited to be in a place where we can start partnering with other organizations, like She Jumps and our local gyms. Thank you, because you are She Rocks. She Rocks is excited to partner with Alpine Ascents International with our Memorial Scholarship. 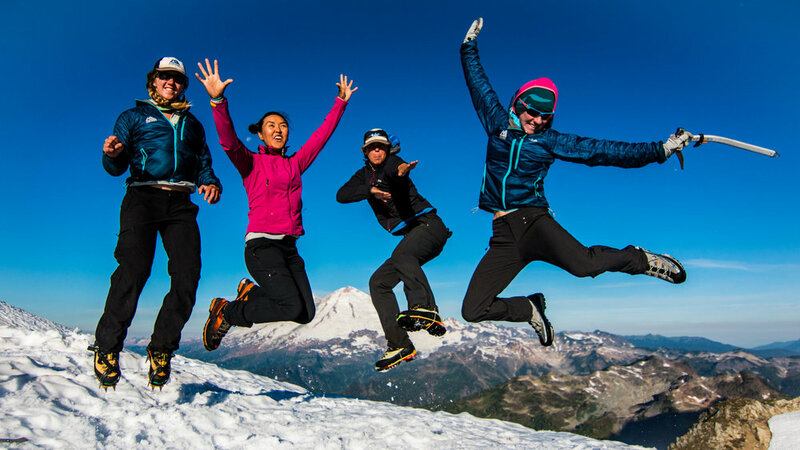 This scholarship includes tuition to their 2017 all female 6-Day Mountaineering Course (Aug 6 - 11) on Mount Baker. Find details here: https://www.alpineascents.com/womens-climbs/ This honors a friend who was passionate about education, from climbing to software development, and is dearly missed by the mountaineering community. *Applications are now closed. * Submit your application here: https://goo.gl/forms/7bWtdFJkot85sUSq1 . The application consists of survey questions to help us create more events for you, and a short essay section to tell us why you want to take the course. Application is open now through July 17th. The catch? No catch! Well, sort of. The only thing we're asking is for YOU to come back and present about your experience to our community. Slide show, video, reading an essay... we'll help you with format and stand up there with you. Why are we offering climbs and programs for women only? At Alpine Ascents International we want to see more ladies out in the mountains. We know from experience that there’s something uniquely special about an all-female expedition. Whether it’s the warm and supportive environment, the truly epic snacks, or just knowing that you’re not alone in the dreaded pee-funnel situation, climbing mountains with other women is a very good thing. Our new all-female programs combine the time tested itineraries of our summit climbs and courses with a supportive and fun environment led by accomplished female guides. We want your experience with us to be more than just tagging a summit. (Don’t worry, we will be definitely be tagging summits.) Our hope is that you leave the Cascades with both the confidence and hard skills that will inspire you take on other challenges in your life, both in and out of the mountains. Maybe you’ll even come back with a new adventure buddy or two.